With an extensive inventory of over 6,000 diamond sharpening wheels, CDX and CBN grinding wheels, Eagle Superabrasives is a leading source of Superabrasive supplies in the United States. Ninety- percent of orders are on location at our Hickory, NC, headquarters and are ready for same-day shipping. We can even fill custom orders in as little as seven days. Don’t settle for subpar Superabrasives; contact the experts at Eagle Superabrasives for all your grinding needs. Diamond Sharpening wheels are the newest product among the sharpening wheels. Manufactured began after the discovery of synthetic diamonds. To date, synthetic diamonds are the hardest materials used for sharpening wheels. 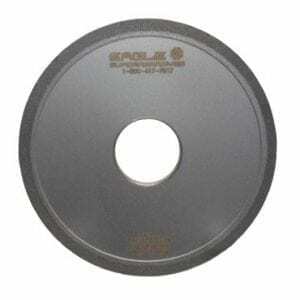 Adding the hardest material known to a sharpening wheel, made it an ideal superabrasive for working with non-ferrous materials. Our Diamond sharpening wheels are made of synthetic diamonds, making them extremely durable and offer a much increased life span. Diamond sharpening wheels are classified by the hardness of the wheel. The hardness of the wheel is based off on how the diamond grains are applied and how they will fracture. If the grains are designed to fracture easily the wheel is considered a soft bond. Hard bonds are used when the wheel will be applied with a large force. Surfaces that are typically easy to cut use a softer wheel and for a finer surface finish and longer lasting wheel, a harder wheels are used. Along with choosing the bond type, it is also important to consider the nature of the material. Diamond may be the hardest material to use as a Superabrasive, but it reacts differently to certain materials such as steel. Due to its carbon make-up and the makeup of steel, grinding or sharpening causes the carbon atoms to detach and weaken the strength of the diamond sharpening wheel. If you are looking for a wheel to cut steel and other ferrous materials like it, check out our CBN wheels. When you’re ready to try the best, trust the experts at Eagle Superabrasives. Our experienced staff will provide support and advice along the way. With unparalleled customer service, superior products and fast shipping, Eagle Superabrasives is an easy choice for all your grinding needs. Contact us today to place an order or request a quote!